Imagine a jigsaw puzzle with the pieces for many areas missing. You are required to work out the missing parts, including what appears on them and the colours, and create a convincing whole. Now imagine the puzzle is a faded, discoloured fresco from the ancient Ajanta caves, of which you are creating a restored digital image that matches how it looked when it was painted more than 2,000 years ago. 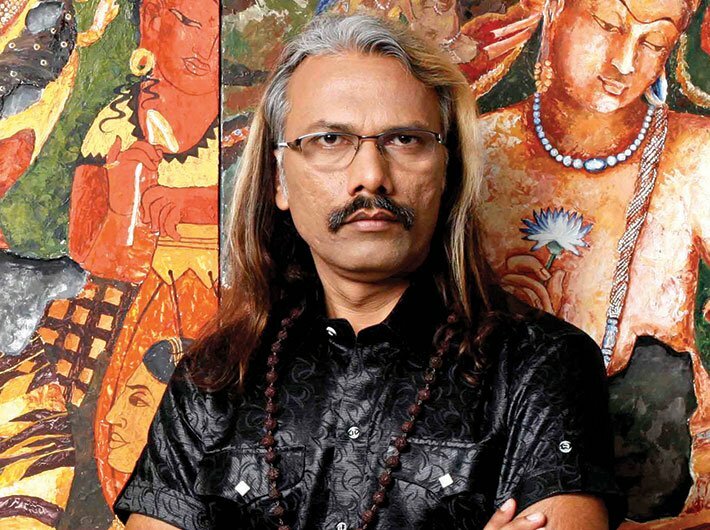 That painstaking work has been the obsession for 10 years for artist, photographer and restorer Prasad Pawar. Having gone over photographs of the paintings square inch by square inch, Pawar has so far completed restoration of 14,000 square inches. He recently put up an exhibition of 70 digital restorations of images from Ajanta with the peeled off parts restored digitally – at the Indira Gandhi National Centre for Arts (IGNCA) in the capital. These paintings are from Cave No 1 at Ajanta, but to be done with the cave, he’ll have to finish working on another 2,23,200 square inches. “And if I think of restoring all the paintings in all 30 caves in Ajanta, it might take me 120 more years,” he says. Since then, he says, he kept thinking about the frescoes and how he might restore them to how they looked in the times they were created. He didn’t even have photographs to work with or inspire him to action: the Ajanta caves are a UNESCO world heritage site and the Archaeological Survey of India (ASI) does not permit photography inside the caves. No one is permitted to touch the frescoes. In those 17 years, Pawar kept his goal alive in his mind. “I’d keep thinking of how I might restore those paintings in some way,” he says. He’d visualise the paintings in his artist’s mind, imagine the unknown artists who worked on them, those who laid the base material in layers on the rock walls, those who prepared the pigments. He studied Pali at Pune university and got in touch with more than 50 language experts and experts on the Ajanta caves from across the world. He went through photo-documentations that others had done of the frescoes. He also read the 7th century Vishnudharmottara, an encyclopaedic Sanskrit work which sets out in one of its chapters the art of image making. Those were years of meditation, reverie, study, quest. Finally, proper photo-documentation began in 2009. Pawar and a team of 12 – artists and experts in Sanskrit, Pali and Magadhi Prakrit – simultaneously studied the intricate artwork, the colour palettes uses, the composition, the details. They took notes on ancient Indian social life, architecture, crafts and lifestyle. Travelling some 35,000 km across the country (covering parts of Maharashtra, Madhya Pradesh, Uttar Pradesh, Rajasthan, Chhattisgarh, West Bengal, Odisha, Jharkhand, Bihar, Tamil Nadu and Kerala), Pawar collected references to artistic techniques used in the paintings. Two major works of reference for Pawar were the works of Lady Christiana Jane Herringham and Ghulam Yazdani. Lady Herringham was a copyist and patron of the arts who from 1909 to 1911 copied out Ajanta paintings, with help from three students of Rabindranath Tagore – the illustrious Nandlal Bose, Samarendra Gupta, and Asit Haldar, later recognised as giants of the Bengal school of art. Yazdani, an art historian, made a photographic survey of Ajanta paintings and his work was published in four volumes from 1930 to 1955. All along, Pawar has worked without any funding. Each square inch of work costs him Rs 15,000, borne by the directors of the Prasad Pawar Foundation which he has set up for this work. “It was our decision to come to people after we had finished some work. Now, we can ask for funding,” says Pawar, after the exhibition at IGNCA. The immersion in the restoration process has created a deep connect between Pawar and the paintings. Now, he wants others to communicate with them – through his digital restorations.